REMINDER: Don’t lose your £10 Amazon Amex cashback! Ends tomorrow. If you registered for the ‘£10 cashback when you spend £30 on amazon.co.uk’ offer two weeks ago, you have until Tuesday evening to spend your £30. Remember that you do not need to buy anything now. The easiest thing to do is to buy a £30 Amazon gift card and add the credit to your Amazon account for later in the year. That is what I did with the three Amex cards I registered. Step 3: When you e-gift card arrives, there is a link in it. 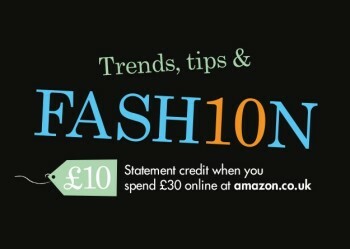 Click on it and the £30 credit will be automatically deposited into your Amazon account. Step 4: At roughly the same time as the e-gift card arrives, you will receive an email from American Express confirming that your £10 cashback has tracked. The credit will sit indefinitely on your Amazon account and will be applied automatically towards future orders. Please do ensure that you spend £30 on each of the Amex cards you registered. If people register for the offer but do not make the necessary spend then Amex is likely to introduce restrictions on the numbers of cards that can be registered per person in the future. Merchants such as Amazon are also less likely to want to participate again. The Amazon links in this article include our affiliate details, and Head for Points will receive a small referral commission on anything you buy. If you intend to buy some ‘real stuff’ instead of a gift card, our link to the Amazon UK home page is here. Thank you for your support. Just spotted more offers added in my Amex account – House of Fraser (again) (10 off 50), Argos (10 off 70) and World Duty Free (10 off 70). Went on a spree around Birmingham yesterday and redeemed at Debenhams, Cafe Nero, Boots and Selfridges. The great thing is that the two are complementary and not mutually exclusive! true about credit cards, but you do give up the chance to buy gift cards from Tesco at 7.2 Avios per £. I am going for the cash back at present. If you have Amex gold 1st year nudge it up to 10.2 avios per £ by using the tesco gift card option at petrol stations..
Is there anywhere you can buy M&S gift cards and get points/miles – other than buying them direct at M&S and getting Amex points. Correct bob: avios collection on the “back burner” – BA take note! I meant the Amex statement credit. Bob, thanks for your help on the M&S question. I just tested it out with a £25 3V card and bought some vouchers! I spend loads in M&S – now need to go stock up on 3V cards! Continually learning new spending tricks on here! The Post Office offer was finally on cardmemberoffers.co.uk yesterday if anyone still needs to load it to supplimentary cards etc. The Post Office offer is now showing as having reached its maximum limit. Shame – I checked yesterday morning & it WASN’T there! It appeared there yesterday early evening. I did put a message on the Post Office article but I hink it got missed by most people. I signed up for this and it went through, but does not show as an offer loaded to my card. Anyone else have this? It won’t show. Only offers you sign up for via your statement page show. Thanks for the clarification and the reminder! Check your inbox form Amazon. Yesterday they offered a £5 bonus on purchasing a £20 gift card order. I was able to use 3v card for the £20 purchase . £5 bonus arrived today – to be used by 15th August. Selected list email, unable to apply for multiple use. Is there a quick way to find out what Amex cards I have registered for this offer? Thanks Raffles for the reminder post. Used four of our Amex cards on the offer, but couldn’t use the fifth as it would have triggered the BA companion voucher too early! That being said, the last few emails I’ve been receiving from Amex have been dropping through quite late (Ocado for example though appreciate that when they bill you has a questionmark over it! ).